Paul DeJong's homer was his 14th on the road. ATLANTA — Cardinals manager Mike Shildt loved watching Yadier Molina grind out a big at-bat in the eighth inning. With the bases loaded and two outs in a two-run game, Shildt got exactly what he wanted from Molina, a veteran star catcher who has helped St. Louis chase down plenty of playoff spots during his 15-year career. 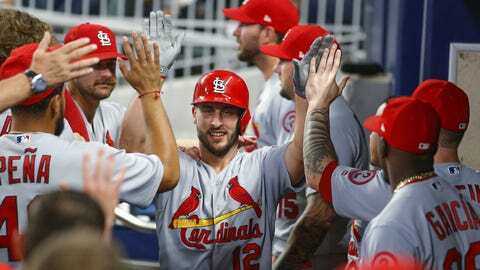 Paul DeJong hit a two-run homer, Molina added a two-run single in the four-run eighth and St. Louis won its third straight game with an 8-1 victory over the NL East-leading Atlanta Braves on Tuesday night. Austin Gomber pitched five effective innings for St. Louis, which holds a slim lead for the second NL wild card. The Cardinals top the National League with 36 victories since All-Star break, and their 43 road wins this season rank second. Atlanta’s division lead dropped to 5½ games over Philadelphia as the Braves lost their fourth in a row after a season-best six-game winning streak. They are 38-38 at SunTrust Park and have dropped 14 of 18 at home. The Braves’ magic number remained at seven as they try to clinch a division title for the first time in five years. Philadelphia beat the New York Mets 5-2. Atlanta manager Brian Snitker can sense his team is pressing. Anibal Sanchez (6-6) allowed four hits and two runs and struck out six in five innings. He faced the minimum through his first three innings and retired his first batter in the fourth before Jose Martinez singled and DeJong hit his 19th homer. DeJong, who is hitting .478 with four homers and 10 RBIs in five career games against Atlanta, added a run-scoring single in the eighth off Dan Winkler. DeJong’s homer was his 14th on the road. Gomber (6-1) gave up six hits, one run and three walks. He struck out five for his fifth victory in his last six decisions, but it wasn’t easy for the rookie. After Ronald Acuna Jr. hit his 26th homer to begin the third, Gomber escaped a bases-loaded jam on Ender Inciarte’s lineout to end the inning. Gomber got Inciarte to fly out to strand a runner at third to end the fifth. Gomber felt a boost in confidence after his last start ended with a 9-7 loss to the Dodgers. Molina’s single in the eighth off Sam Freeman scored three runs. Molina was credited with two RBIs, and a third run scored because Acuna made an error in left field. Tyler O’Neill, who entered as a pinch-runner in the eighth, had a run-scoring double, and Marcell Ozuna followed with an RBI single to make it 8-1. John Brebbia and Jordan Hicks faced the minimum in the sixth and seventh, Dominic Leone pitched around a walk in the eighth and Mike Mayers faced five batters in the ninth. The Cardinals improved to 69-6 when leading after seven. After walking 39 in their last five games, the Braves didn’t issue a free pass until the eighth, when Jonny Venters, Winkler and Freeman each walked a batter. Of the 35 runs allowed on this homestand, 15 reached with a walk. St. Louis has won eight straight games in Atlanta dating to 2016, the best run since the Cardinals took 11 road games in a row against the Braves from 1967-68. Cardinals: RHP Jack Flaherty (8-7, 2.86 ERA) will make his first career appearance against Atlanta. The 22-year-old rookie pitched six innings, allowing four hits and one run, in losing his last start 3-0 to the Dodgers. Braves: RHP Touki Toussaint (1-1, 4.67 ERA) gets his fourth career start as he faces St. Louis for the first time. The 22-year-old rookie is 1-1 with a 3.31 ERA as a starter.